The Life Extension Blog: Do Soft Drinks Cause Cancer? Do Soft Drinks Cause Cancer? We know that soft drinks aren’t healthy for many reasons — one of which is triggering weight gain. However, a study conducted in Singapore has us even more concerned. According to the study, drinking two or more sodas a week increased the risk for pancreatic cancer by 85% compared to nondrinkers. They looked at lifestyle, environmental factors, and diet. We should also note that the study was based in a country whose populace, like ours, tends to enjoy (at least) an occasional soft drink. Why are soft drinks linked to cancer? Well, it may have to do with their high sugar content. A single soft drink may contain up to 41 grams of sugar2, which is a lot to put into your body at once. This can cause your blood sugar levels to spike and your pancreas to release large amounts of insulin. Insulin allows the entry of glucose into cells, where it’s used as an energy source. The Singapore scientists think this may be a reason why soft drinks are linked to pancreatic cancer. So if you’re concerned about cancer, it may be wise to avoid soft drinks which can wreak havoc on your blood sugar and insulin levels. 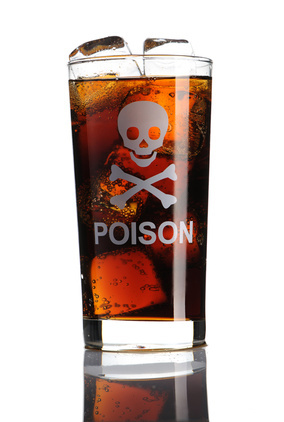 Let’s face it, most people drink sodas because they taste good...and many of us are hooked. The good news is that you can still enjoy a soda without the sugar or artificial sweeteners. In fact, seltzer water is a great substitute for soda. It has the fizziness which soda drinkers seem to enjoy, but it doesn’t contain the sugar and calories. You can drink it alone, or you can mix it with a hint of your favorite fruit juice. Another option is to sweeten your seltzer water with sugar substitutes such as stevia or xylitol. These ingredients are safe, healthy, and they don’t raise blood sugar levels. Here's a nice lemon-lime soda recipe courtesy of SparkRecipes.com. This drink not only satisfies your sweet tooth, but it’s nutritious too. It contains lemon and lime juices which are chock-full of antioxidants. Mix your lemon and lime juice, stevia drops, and salt in a pitcher. Add the bubbly water, stir gently, pour into tall glasses over ice and enjoy! Cancer Epidemiol Biomarkers Prev. 2010 Feb;19(2):447-55. Available at the Pepsi Website, Accessed October 1, 2012. Exp Diabetes Res. 2012;2012:789174. Epub 2012 Jun 4. Curr Eye Res. 2006 Oct;31(10):875-83. Mol Cell Biol. 2006 Dec;26(24):9302-14. J Surg Res. 1996 Jun;63(1):310-3.
from now on i will stop drinking soft drinks. thank you for this information. Soda is my favorite drink.Now Every time I want to drink it I will surely make a second thought. eyeglasses- Our pleasure! We’re glad to help. This is an interesting study, but I was wondering if they tested this with diet sodas as well. You mention the blood sugar spikes, and I think that this is a great point given that we consume a really high amount as is. However, these diet sodas use sugar substitutes, and I was wondering if any long-term studies have been conducted with them? Caffeine-free Diet Pepsi is my only vice. I'm not giving it up EVER! Ask yourself, Is it worth dying for? Kombucha is a great alternative to soda! Good clean fresh water is the best thing to drink. Carbonated water products have been linked to increased stroke risk. Most people do not drink enough water and walk around dehydrated and think they're hungry. Drink water and save your health and your budget. Skip high fructose corn syrup and all artificial sweeteners too. Thanks Maylin for this blog. It’s a great message to everyone. kevin morrison - Thank you for reading!